CX Journey™: #CX Buzzwords or the Real Deal? The customer experience profession has a lot of buzzwords. Or does it? 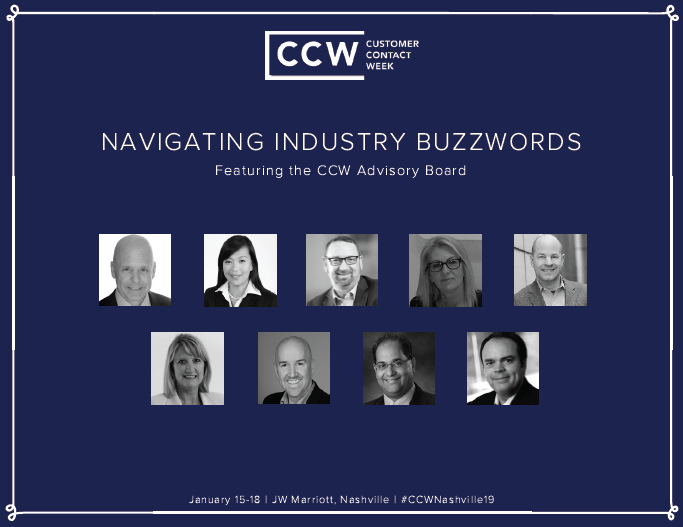 I was recently given access to a report by the team at Customer Management Practice, organizers of the popular CCW (Customer Contact Week) events. 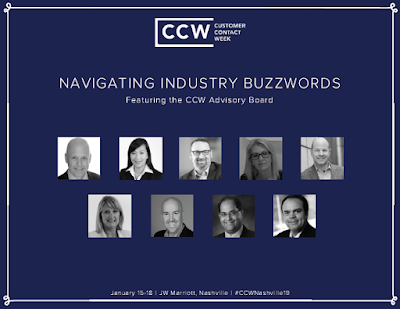 The report is titled "Navigating Industry Buzzwords" and contains a compilation of thoughts by the nine members of the CCW Advisory Board on those so-called buzzwords. For this report, the advisors were asked to identify three words that resonate with their organizations and to dispel the buzzwords myth by getting to the core of why these words (listed below) are the real deal. Let's start with a definition of "buzzword." According to dictionary.com, it is a word or phrase, often sounding authoritative or technical, that is a vogue term in a particular profession, field of study, popular culture, etc. Given that definition, honestly, none of those words are "in vogue" terms; they're all an important part of what we do, part of our (customer experience professionals') daily language. I feel like calling them buzzwords gives a negative connotation or refers to a fly-by-night term that will be gone next week. Where I see the problem with these words is how they're defined and how they're used. For example, I heard recently that someone thought "customer journey" was the hot new word for "customer experience," which is now passe. OK, please don't buy into that. Let's stop renaming things - customer experience is customer experience - and focus more on understanding and executing. On that note, let's take a look at how the Advisory Board members define and use the three terms they picked. Wendy Liu is VP, Customer Care and Executive Care Response Liaison at Comcast. Her three terms are transformation, journey, and culture. Transformation: Taking the best of what we know about ourselves, examine closely where we have challenges, and enlist our team members in making the change together. Journey: A view and practice that treats our team members and customer interactions not as single transactions or destinations but as an experience with well-defined maps and thoughtful guides to help our teams and customers navigate and discover. Brad Nichols, Global Customer Service Leader for Dun & Bradstreet, defined his three favorite terms as follows. Culture: The way ‘things are done’ around here. What gets rewarded, punished, and how to behave to get ahead. And when Shep Hyken was asked what his three favorite terms meant for his organization, he answered as follows. Experience: We are all about creating an “amazing” experience for our customers (and for our employees). Metrics: You can’t manage what you don’t measure. Culture: Without the right culture in place, we won’t deliver the experience we want our customers to have. To be the best place to do business with, we have to be a great place to do business with. What’s happening on the inside is felt on the outside by the customer. Be sure to check out the report to find out how the other six Advisory Board members chose and defined their "buzzwords." And then join me in Nashville from January 15-18, 2019, for CCW Nashville, when Jenn Lim, CEO & Chief Happiness Officer, Delivering Happiness, keynotes the event, and amazing speakers from Postmates, Subway, HBO, and Toll Brothers, just to name a few, speak on the same stage. IABC Gold Quill entry: Our challenge was to design and implement a multi-faceted customer experience initiative supported by a change-management strategy. Judge’s comment: Someone graduated with honors from buzzword college.